The Avalanche are not the NHL’s first foray into the Denver area. And MLB’s Rockies are not the first team in Denver to be called as such. In 1976, the Kansas City Scouts moved to Denver to become the Colorado Rockies, until 1982 when they moved again to New Jersey to become the Devils. For six years, there was NHL hockey in Colorado and for one of those seasons (1979-80), they were coached by the most famous coach in hockey, Don Cherry. Not surprisingly then, the slogan for the team that year was “Come to the fights and watch a Rockies game break out!”. Seriously, that was on their advertising. Unlike Don Cherry, I have no words. 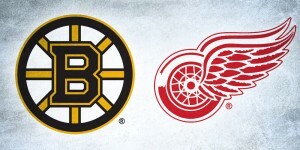 But we’re not here to debate the role of fighting in hockey, we’re here to discuss the logo. 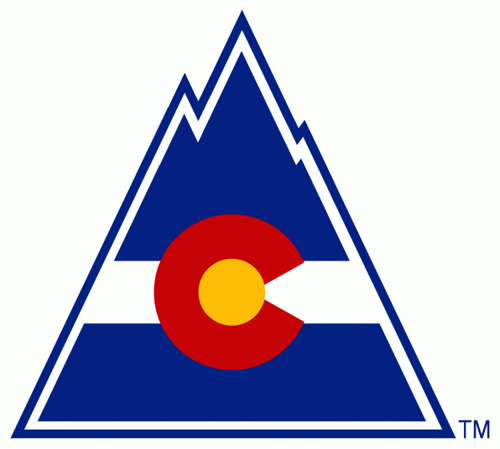 For those that know what Colorado’s state flag looks like, the inspiration for this logo should be easy to figure out. Actually, it borders of plagiarism. Essentially, the team took the exact same design and placed it on the outline of a mountain instead of a rectangular flag. While I definitely appreciate the simplicity and boldness in the design, the fact that the entire concept is stolen from somewhere else – and that the team was the result of a rushed relocation from Kansas City – makes my excitement for the logo similar to safety glass: tempered. What is it with Denver-based NHL teams rushing their logo designs? I ranked the Avalanche’s logo very low in the BTNHL Countdown, and I wondered if it was the result of a rushed concept when moving the team from Quebec City in 1995. When I talked to the designer who worked on the Avalanche logo, he essentially confirmed that. Relocations are usually sudden and don’t give the team the proper amount of time to really create a good concept for a logo, and Denver’s been cursed with that twice. So, after putting away from my disdain about a stolen concept, how does a flag design translate into a hockey logo design? In this case, not too badly, and it’s oddly in step with the era in which the Rockies existed, but that’s necessarily a good thing as it dates the design. The colour combination and the geometric shape of the C gives it a certain ’70s-’80s flair to it (despite that the flag design dates back to 1911), and the resulting jerseys from this colour combination have the same aesthetic, which is pretty awful. The colours, because they’re from the state flag, represent the sunshine (gold), the skies (blue), the mountain tops (white) and the soil (red). I don’t think they considered any of this when making the jerseys, but whatever. The only original part of the logo – the mountain – is nice and solid, and gives a good triangular shape for the rest of the logo to sit in. I’m not sure I’m crazy about the actual shape of the peaks as they’re incredibly jagged compared to a typical mountain logo shape and could be altered a bit, but that’s pretty small potatoes. Like fingerling potatoes. Because it’s primarily a flag design, it’s going to have a lot of elements that I like: simplicity, strength and boldness. Again, I’m not crazy about the colour combination, which is actually very Florida Panthers-esque, but my guess is that if the Colorado Rockies still existed in Denver today, they would have been through multiple jersey redesigns, a dozen third jerseys and probably a couple new logos. But, I just can’t get past the fact that the entire concept is stolen from somewhere else, and blatantly stolen at that. If the designer of the Colorado state flag were still alive in 1976, I’m sure they would’ve been sued for stealing intellectual property. If any of my designs were used in this way, I’d be pretty pissed. They got a concept for free and probably paid some lackey a minimal amount to put it on a mountain shape. Bleah. Put this into the BTLNHL Countdown, and it would be placed 20th, just ahead of the Islanders, and right behind the Hurricanes. Out of curiosity, why is it bad that the Rockies used the Colorado state flag in their logo, but it is fine for the Blue Jackets to use the Ohio state flag in theirs? Also, I am sure that the flag is not copyrighted, but the state may have power to disallow usage of its flag’s design. Totally fair comment. The difference is that for the CBJ’s logo, the Ohio flag is stylized in that they turned it more into a pennant shape and gave it a lot more movement that the more stoic rectangle of the flag, so the elements on the flag actually had to be shaped and actually designed a certain way. The elements on the Rockies logo don’t change at all and are in no way shaped any differently from the flag. Also, there’s the additional element of the star thrown in there, so the flag doesn’t dominate the logo overall. Sure, the Rockies have the mountain, but it’s used more as a placeholder for the flag design while the Jackets use the star as a completely different and added element. Dude the things your complaining about are small potatoes indeed. i happen to be a new jersey devils fan and i go back to the rockies and the thing i loved about them the most was the jerseys!!! The home white was sharp and colorful and clean looking and simple! Today’s jerseys look like cartoon characters that are overdone and garish!! Long live the rocks!! Don’t get me wrong, it’s a nice logo. 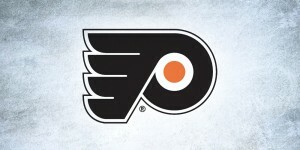 But, more importantly, it’s a nice flag design which has been stolen to make a hockey logo. Don Cherry was the best thing that ever happened to that franchise back in 79-80 and if Ray Miron didn’t purposely keep that stiff Hardy Astrom and handcuff Cherry then the Rockies would’ve made the playoffs that year and then who knows after that? Miron was scared of Cherry and it showed! I’m scared of Cherry too. Or I would’ve been back then anyway. I think I could outrun him at his age now. It’s like the Eye of Sauron mated with Mount Doom. 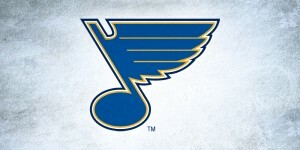 Always had a soft spot for the logo since my father grew up with Randy Pierce.